Dr. Keller’s Original Glutathione Formula is a 100% natural supplement that increases glutathione levels. This supplement does not contain glutathione (which breaks down during the digestive process, but contains ingredients that stimulate the production of glutathione), including: vitamin C; N Acetyl cysteine, L-glutamine, N Acetyl D-glucosamine, quercetin, milk thistle extract, alpha lipoic acid, cordyceps and conjugated linoleir acid. More information about the benefits of each of these ingredients is described below. Younger looking skin – less dry skin, reduced appearance of wrinkles, etc. 3) Have the ability to pass through two critical membranes – one at the entrance to the cell, and a second at the entrance to that furnace inside each cell called the mitochondria. 4) Have the ability to recycle the spent glutathione through the liver after it has been utilized to eliminate the oxidants that are the byproduct of ATP production within the mitochondria. Dr. Robert Keller’s Original Glutathione Formula is 100% natural. No sugar, starch, yeast, soy, dairy, gluten or preservatives. Calcium Ascorbate is an optimal nutritional supplement that combines Ascorbic Acid (Vitamin C) with Calcium Carbonate. By combining these two dietary ingredients, it is a buffered source of Vitamin C that will not contribute to gastric irritation in sensitive persons. N-Acetyl cysteine is derived from the sulfur-containing amino acid, cysteine. It is produced naturally in the body and is also obtained from the diet. Along with glutamic acid and glycine NAC is a precursor to glutathione, which is the body’s most important cellular antioxidant. Proponents of NAC find that NAC is an immune enhancer; prevents and treats cancer; detoxifies heavy metals; treats smoker’s cough and bronchitis; prevents heart disease; slows progression of HIV; relieves hangover symptoms; reduces exercise fatigue. It is used as a supplement for bronchitis, HIV infection, cystic fibrosis, cancer chemotherapy support, acetaminophen poisoning, heavy metal poisoning, and septic shock. This is the most abundant of the amino acids in the human body. Its main storage site is in the musculature, where about 60% of all the unbound amino acids are glutamine (glutamine makes up a smaller percentage of muscle protein, the main bound form). Glutamine has been called a “conditionally essential” nutrient , because it is non-essential in normal situations (manufactured by the body in adequate quantities; not required in the diet), but in illness or injury becomes insufficient (there is then a need for supplementation from the diet or other sources). Used to strengthen immune function & is one of the building blocks of joint tissue and other connective tissues .In certain studies has been known to restrain and treat cancer. As to all kinds of inflammations, it is able to aid in therapy effectively. And also bone arthritis and joint pains have been reduced with using it alone or together with MSM. This is an anti-oxidant that belongs to a group of plant pigments called flavonoids that are largely responsible for the colors of many fruits, flowers, and vegetables. Flavonoids, such as quercetin, provide many health-promoting benefits. They act as antihistamines (which are useful in reducing allergy symptoms) and help reduce inflammation associated with various forms of arthritis. Quercetin also works as an antioxidant by scavenging damaging particles in the body known as free radicals. These particles occur naturally in the body but can damage cell membranes, interact with genetic material, and possibly contribute to the aging process as well as the development of a number of conditions including heart disease and cancer. Antioxidants such as quercetin can neutralize free radicals and may reduce or even help prevent some of the damage they cause. Quite Possibly the “Universal” Antioxidant. The body needs ALA to produce energy. It plays a crucial role in the mitochondria, the energy-producing structures in cells. The body actually makes enough ALA for these basic metabolic functions. This compound acts as an antioxidant, however, only when there is an excess of it and it is in the “free” state in the cells. But there is little free ALA circulating in your body, unless you consume supplements or get it injected. Foods contain only tiny amounts of it. What makes ALA special as an antioxidant is its versatility—it helps deactivate an unusually wide array of cell-damaging free radicals in many bodily systems. In particular, ALA helps protect the mitochondria and the genetic material, DNA. As we age, mitochondrial function is impaired, and it’s theorized that this may be an important contributor to some of the adverse effects of aging. ALA also works closely with vitamin C and E and some other antioxidants, “recycling” them and thus making them much more effective. Cordyceps sinensis, known in China as Dong Chong Xia Cao (“Summer Grass, Winter Worm”) and in the West as Cordyceps or The Caterpillar Fungus, has long been used in Traditional Chinese Medicine for the promotion of cardiovascular, sexual and immune system health and as a general energizing tonic, as it oxygenates the blood. Traditional Chinese Medicine have used it to treat fatigue and other ailments for 1,500 years. A naturally occurring free fatty acid . Used in small amounts it is a newly discovered good fat that may be a potent cancer fighter. In studies, very small amounts of CLA have blocked all three stages of cancer: 1) initiation, 2) promotion, and 3) metastasis. Most anti-cancer agents block only one of these stages. What’s more, CLA has slowed the growth of an unusually wide variety of tumors, including cancers of the skin, breast, prostate, and colon. Also know to aid in weight loss and the conversion of fat to lean muscle mass and is used extensively by body builders and weight loss professionals. So it is a naturally occurring nutrient with the ability to help you pack on lean muscle, reduce body fat and at the same time possesses health promoting properties. Allergy warning: Dr. Keller’s Original Glutathione Formula is derived from mushroom and shellfish. The information described herein is not intended to treat, cure, diagnose, mitigate or prevent any disease. 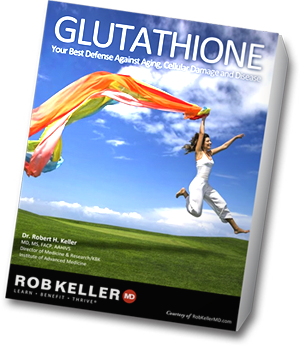 Dr. Robert Keller’s Original Glutathione Formula does not cure or treat any disease or illness. It simply gives your cells the nutrients they need to produce more glutathione, which in turn helps every cell function better. She may wish to ordr, I don’t know. She did ask me”where did I get my glutathione from when she visited me during Holidys. Can you simply send her a link ti your website? Is this the same dr.keller who made maxgxl also? I have been personally taking Robert Kellers Original Glutathione Formula and have so much more energy. I stopped taking it for 1 week to see if I felt any different. Within 72 hours I felt sluggish and tired once again. I started taking 6 capsules in the morning and felt energized again within 48 hours. I fully recommend Rob Kellers Original Glutathione Formula to anybody who is thinking about trying it.